Istanbul Chamber of Industry (ICI) organized a Japan Day in order to promote investment opportunities and cooperation between two countries. The event was held at Odakule and attended by many industrialists who wished to export to and invest in Japan. 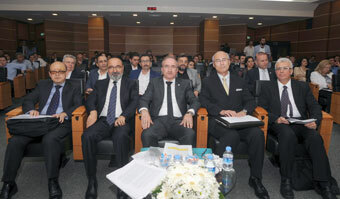 Sadık Ayhan Saruhan, Member of the ICI Board of Directors, delivered the opening speech of the event. Saruhan noted the interest to the meeting had confirmed their decision to organize the event. Saruhan mentioned that Turkey was a country aspiring to become a key global player in the future and said that Turkey would become much more significant and powerful in the coming years thanks to the Third Airport, Third Bridge over Bosphorus, Izmit Bay Crossover Project, Eurasia Tunnel, communications and transport infrastructure across the country, important steps in aviation and defense industries, and nuclear power investments. Japan, one of the world’s most developed economies, is still a significant trade and investment partner of Turkey, Saruhan said, and expressed that the biggest reason behind the lower-than-intended trade volume between the two countries was geographical distance, a factor he noted was no longer an issue in the era of globalization. The two countries must be brought closer together by further improving the means of transport and communications available to them, he said. Saruhan mentioned the construction projects as another significant aspect of Turkish-Japanese relations, and told that Japanese companies played a role in the recent series of billion-dollar strategic projects like Marmaray, Izmit Bay Crossover Bridge and the Second Nuclear Power Plant, and expressed their Turkey attached great importance to participating in the Japanese projects with its supplier companies. Saruhan stressed that, countries adopting a high-technology industry were the winners of the cutthroat global competition of today, and said that Japan’s economic success as a global power is driven by its industry’s focus on technology. Reminding their approach that prioritizes value and technology for industry, Saruhan said that these common approaches should bring in new opportunities for technological cooperation between the two countries. Global trade rules are being reshaped by large-scale free trade agreements, said Saruhan, also mentioning Japan’s ongoing free-trade negotiations with the U.S. and the EU, the two giants of global trade. He concluded his words by expressing their belief that a rapid conclusion of free trade negotiations between Turkey and Japan would greatly contribute to the improvement of the relations between the two countries. Norio Ehara, Consul General of Japan in Istanbul, took the floor after Saruhan and began his speech by mentioning that the countries were mutually attractive markets. Two societies regarded each other in a highly positive way, Ehara said, and told that economic relations have intensified with 220 big Japanese companies investing in Turkey. Ehara drew attention to the possibility of expanding the scope of the economic cooperation between Turkey and Japan to involve other countries, citing the Central Asia and the Middle East as examples. According to Ehara, Japanese companies had quite a detail-oriented and prudent business mindset while Turkish companies were successful in risk management and enthusiastic to enter new markets. These two mindsets could complement each other to secure great achievements in the global market, Ehara said. He told that the current Japanese government was highly supportive of business and investment and that the free trade agreement negotiations between Turkey and Japan were an example of this support. Drawing attention to the quality and durability inherent in Japanese products, Ehara stated that these products offered cost advantages and higher profitability for consumers in the long-run, despite their initial cost. He said that Japanese business mindset was far from a “hit-and-run” mentality. Japanese companies preferred long-term investments and the Japanese tradition of confidence prevailed in the business life as well, Ehara said. Yasuyuki Ishiga, JETRO (Japan External Trade Organization) Deputy General Manager in Istanbul, then took the floor to give updates about JETRO’s operations. Ishiga told that Japan achieved significant economic progress with the Japanese government’s recent reforms, including reduced corporate tax as well as subsidies for health care, energy, and tourism. Ishiga drew attention to the fact that Japan ranked lower in terms of business expenses, which had been considered the most important issue as revealed by past surveys. He mentioned that Japan ranked first in the world in terms of the budget allocation to research within GDP. Ishiga also mentioned the country’s considerable investments in tourism, noting their goal of increasing the number of foreign tourists from 20 million in 2015 to 40 million in 2020, the time of Tokyo Olympics. Musa Demir, Principal Commercial Consultant of Turkey in Tokyo, said that mutual investments were not adequate despite the friendly relations between the two countries. Demir said that the volume of Turkish exports to Japan remained at USD 335 million in Japan’s total goods and services imports of USD 650, which was due to the lack of interest by Turkish companies and Japan’s unfamiliarity with Turkish products. Turkish companies perceived Japan as a difficult market, which was a prejudice to be overcome, stressed Demir, and drew attention to the detail-oriented mindset of the Japanese people and importance of patience while conducting business with them. Muhammet Aksan, Deputy Chairman of DEIK Turkish-Japanese Business Council, told that a combination of Turkish attitude of fast decision-making and Japanese prudence would deliver great results. He said that Japanese were committed to their standards, and one must think on a long-term basis in order to conduct business with the Japanese. Aksan further drew attention to the significance of ongoing negotiations for a free trade agreement between Turkey and Japan, which would enable great opportunities if concluded positively. Later, a panel themed “Tips for Conducting Business with Japanese Companies” took place, moderated by Musa Demir, Principal Commercial Consultant of Turkey in Tokyo. Oğulcan Kemal Sagun, Deputy Chairman of the Sagun Group’s Board of Directors; Muharrem Çilek, Chairman of the Çilek Furniture’s Board of Directors; and Mehmet Taş and Bilgin Dedeoğlu, Managing Partners at Aksan Law Firm’s Japanese Desk shared their experiences with the participants during the session, which ended with a Q&A session.